Cutting laminate stair treads can be a little tedious, mainly because of where the laminate tread meets the stringer or wall. It is not always square and the stairs can vary in width. The different widths of each stair may not be much but even 1/8 inch difference can be noticeable. 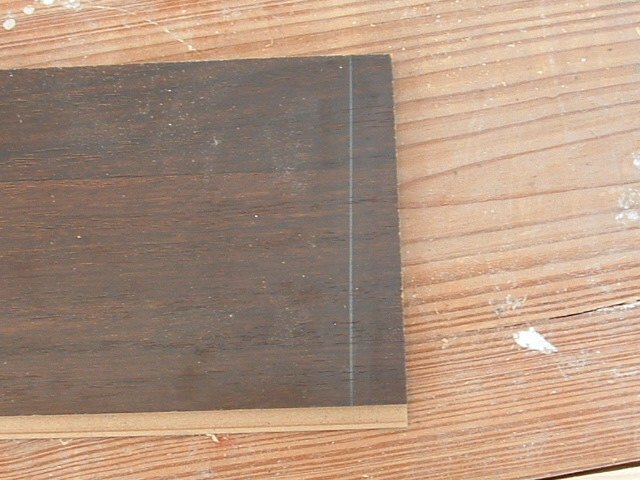 When I cut the laminate stair treads what I want to see is the treads to be flush against the sides with a minimal gap if any. If you do end up with gaps they can be filled in with some matching putty. One thing to keep in mind is that sometimes the stringer or the wall (the areas on the sides of the stairs) may move. 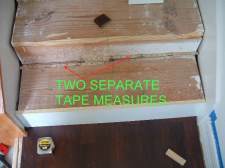 An example of this is if you cut the tread a little big and force it in place, you may notice that the wall or stringer is pushed in, so now the previous stair will show gaps. 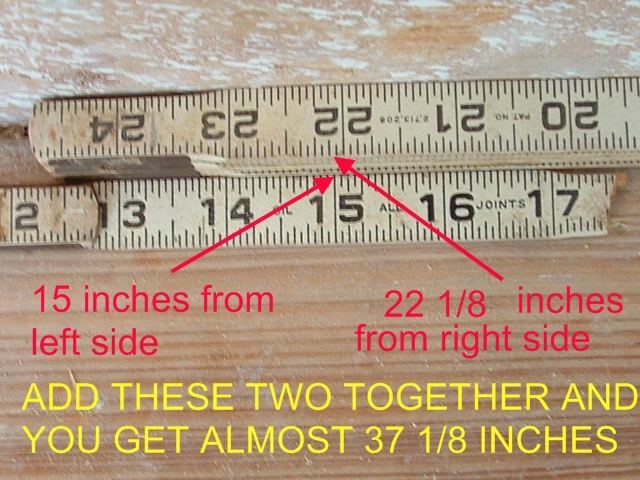 Just keep this in mind as you install each stair. 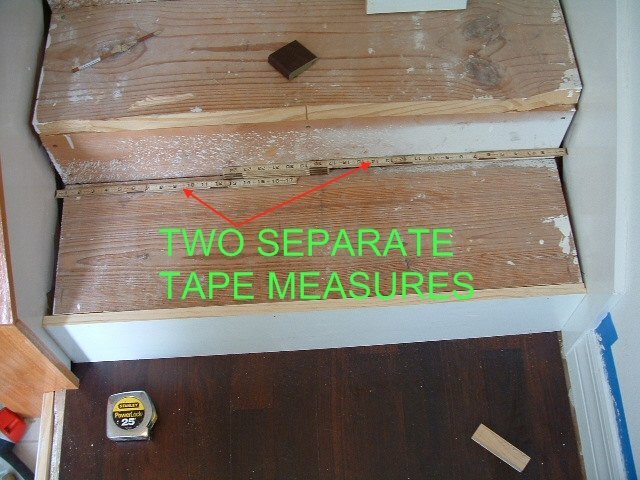 You may have to cut a little off the tread so it won't push the wall or stringer in. 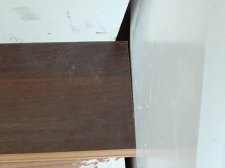 On this particular flight of stairs (Below) one piece of laminate was not big enough to cover the stair from front to back. I divided the depth of the stair so I would have two equal size pieces. 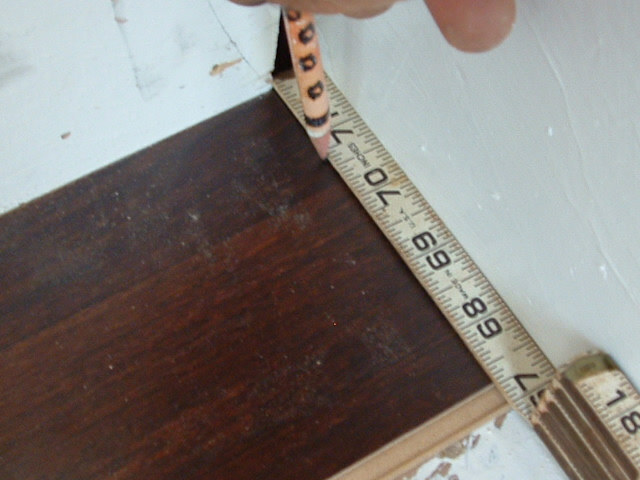 In this photo I'm using a scrap of the Mohawk laminate to check if the stair is square to the stringer. You can see there is a gap. I need to cut the tread to match this angle. As shown in the next photo. Here I place a scrap piece of laminate against the riser and against the stringer. Then I simply use a straight edge to transfer the angle to the scrap. Now that I have the angle on my scrap I can set my miter saw to this angle and cut the right side of my tread. But now I have to get the angle for the left side so I can finish cutting the tread. I will use the same procedure on the left side as well. 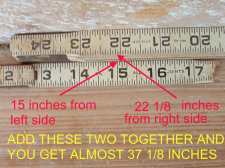 Once I get the angle for the left side I need to get the exact measurement as shown below. When cutting laminate stair treads its best to cut as close to the sides as possible. The way I do this is to use two separate tape measures. You will have to use a little math here. Use one and measure from the right. Use the other and measure from the left. Do the math in the middle. I like this type they are easier to handle. You can use which ever ones works best for you. This photo should help explain how I arrive at the correct size I need to cut the stair tread. As I measure and cut each stair tread I mark the stair and the tread with numbers and set them aside until I'm ready to glue them on. After you cut a few it should get a little easier, take your time so your stairs will look like you paid someone to do them.